Lately, the news has been filled with stories about the rising gap between the average American and a wealthy American. The net worth divide in this country is at its highest level since the Gilded Age, that beautiful time when Robber Barons sent private armies to kill union organizers, child labor was the norm, tenements were typical working class housing, and the average life expectancy for a poor person was roughly the same as in most Third World Countries. To give you an idea of how extreme this gap is, currently in America, the top 10% of the population control 80% of the wealth, and the other 20% has to be split up among the rest of us. In hard numbers, that works out to a little over 3 million people controlling most of the nation's financial resources, and other 309 million of us have to fight over what is left. On a side note, Teddy Roosevelt busted up the monopolies, created the Sherman Anti-Trust act, and in general brought an end to the Gilded Age. More interestingly, he was a Republican. Today, he would be exiled as a Communist. And just so you understand where real Communists fall in the political spectrum, compared to them, Teddy WAS very conservative. To return to the point, this wealth gap in America is more extreme than it has been in over a hundred years, and it is getting worse. This is also a global problem, but I am just going to focus on this country. When you point out the facts that I have just laid out, you get accused of class warfare. Pundit after pundit calls it jealousy for those who by their hard work make a success of themselves. You hear that putting money in the pockets of the rich is a good thing for the overall health of the economy. The Right claims that taxing the rich is what is stopping the recovery dead in it's tracks. I should point out that saying that is very dangerous. Calling a lie a lie is the most forbidden thing you can do today. No matter how outrageous the statement, you cannot call it a lie. But it is, the income disparity in America, and the world as a whole, will ultimately bring down the entire system. Even though Teddy Roosevelt ended the era of the Robber Baron, the system did not really right itself until the Great Depression, when the vast fortunes of the ultra rich vanished in a puff of smoke. And perhaps that is what should have happened in the last meltdown. If all the Wall Street Banks had gone broke, the income disparity would have been greatly reduced. However, it also would have meant that for the average American, the family pet would have become a dinner option, and the family car would have been a nice place to live. So obviously, we could not let the system collapse, no matter how much it might have helped level the playing field. We would have had an entire lost generation, just like we did for the entirety of the 1930's. Remember, it took the massive industrial mobilization of World War 2 to completely wipe out the aftereffects of the Crash of '29. That said, I would like to explain why income inequality is a bad thing, not just for those on the bottom, but for the country in general. It boils down to one simple statement. Wealth is a finite resource. In that regard, it is no different from any other commodity, food, oil, precious metals, water. There is a limited amount of it, and because of that, it functions just like any other commodity. The more scarce it is when it is a vital resource, the more problems that situation causes. Your parents may have made the statement, "Money doesn't grow on trees," when you wanted something that they couldn't afford. My parents said it to me all the time and it was one of the most important lessons of my childhood. Money is limited, which is a good thing. If money was an unlimited resource, it would have no value at all. That would lead to something called Hyperinflation, which is an even worse financial disaster than a Depression. Hitler came to power in a country where literally a wheelbarrow full of money would not buy enough food to feed a family for a week, and the economic situation in Germany at the time was one of the prime causes of his rise. But the point of this is, when you flood the system with newly printed money, it does not add capital to the equation, it devalues the money. If everyone had a million dollars, a million dollars would not have any value. So to sum up this point, money is a limited resource, and must remain so, in order to retain it's value. Moving on to why economic disparity is a problem; when the limited resource called money gets concentrated in the hands of a few, for all intents and purposes, it gets taken out of the system. It gets locked up and not used. In essence, this is similar to the O.P.E.C. oil embargo of the 1970's. The oil producing countries decided as a whole to stop selling oil to America, and hold on to it, which brought the economy to a literal halt. Rather than doing anything else with a Saturday, you would wait for hours in a gas line, hoping that there would be some left by the time you got to the pump. Now we are facing a monetary embargo by the wealthy. This is not necessarily a deliberate embargo, although some of it is probably politically motivated, but it is an embargo nonetheless. The reason for this has a simple explanation; rich people cannot spend enough to keep the economy moving. Remember, 3 million people possess 80% of the wealth. To put this in context, in 2011 alone, almost 13,000,000 new cars were sold. If the wealthy were the backbone of the economy, this means that every single person in the top 10% would have to buy four cars every year for the rest of their lives to keep the auto industry afloat. This is why the wealthy do not drive the economy, and why the wealth gap is a problem. When the money concentrates in the hands of the few, it stops there, because they do not need enough stuff to keep people working. No one needs four new cars every year, so that money just sits there. 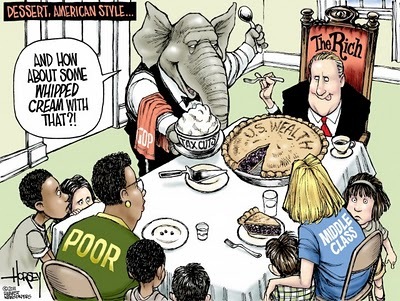 They cannot spend enough to make up the difference, but that money is taken out of the hands of the bottom 80%. Remember, it is a limited resource, you cannot add new money into the system without devaluing the existing money. As the process continues, when consumption drops, the need for production drops at the same rate. This results in layoffs, which cause further drops in consumption because more money is taken out of the system. It becomes an accelerating trend, the less that is spent means that there will be less to spend down the line. And the wealth continues to concentrate, which in the end will destroy the economic system. There is a dark irony here, the concentration of wealth, which is the goal of individual capitalistic impulses will ultimately destroy the capitalist system as a whole. It would be hilarious if the toll it exacted on the rest of us wasn't do devastating.